While being interviewed by Chuck Garfien on Comcast Chicago (hat tip to MetsBlog), J.J. Putz admitted that he had bone spur in his elbow long before his trade from the Mariners to the Mets, the Mets were aware of it, and the Mets didn’t put him through a physical prior to making the deal official. There are so many things wrong with this I don’t know where to start. Why would the Mets knowingly acquire damaged goods, especially knowing the high salary that came with it? Why would they give up so much talent in return? The answer is simple: season ticket sales. The Mets latched on to the nonsense propogated by the media that the reason they missed the 2008 postseason was due to a terrible cast of characters in the bullpen (rather than the mismanagement of the bullpen, the lack of an extra slugger, piss-poor fundamentals, below-average defense, occasional lackadaisacal effort, or the fact the rotation was absent of a high-quality starter behind Johan Santana). It was easy to blame all the team’s woes — and in particular their second consecutive late-season collapse — on one scapegoat, the bullpen. Once everyone bought in to the idea that “the Mets bullpen needs a makeover”, the signing of Francisco Rodriguez combined with the trade for Putz was a seemingly simple solution that would propel the Mets back into the postseason. Therefore, the story the Mets sold to prospective season-ticket buyers was: “we’re bringing back the same team, adding two elite relievers, so we’re a lock to make the playoffs — hurry and buy a ticket package lest you get shut out from the glory and celebration in October”. It didn’t matter that Putz was damaged, and could possibly miss the bulk of the season. As long as the injury was kept secret, people would believe the Mets would have a fantastic bullpen — perhaps the best in all MLB — and therefore would easily trot to “meaningful games in October”. Why else would a team send seven players to two different teams for a $7M player? Why else would they completely ignore a documented history of chronic elbow problems? Further, why would a team allow a high-salaried pitcher with a known injury compete in the World Baseball Classic? Perhaps because if they didn’t, people would wonder why — and the injury could be revealed. Or, maybe the plan was to keep fingers crossed in hopes that Putz could stay healthy enough in short spurts to display his 95 MPH a few times — in turn getting Mets fans jazzed up to buy ticket packages in March. This time, it’s not a conspiracy theory. This time, the Mets really did know something, and kept it from the public, for the sole purpose of ticket sales. Which makes one wonder about Jason Bay and the various concerns that caused the Red Sox to pull a 4-year contract off the table. Suddenly, we can’t be so sure to believe Bay’s assertion that he’s completely healthy. After hearing this news from Putz, we need to re-examine the detailed, bizarre story written by Rob Bradford of WEEI regarding what happened with Jason Bay and the Red Sox. Perhaps the Red Sox cautious approach was valid. Maybe there is a good reason that the Mets were the only other publicly known bidders for Bay’s services. 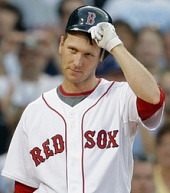 Of course, it doesn’t matter whether Jason Bay has potential injury issues that may creep up as soon as mid-season. All that matters is you phone in your ticket order — NOW. Leave the worrying about what happens after Opening Day to the Mets. The Red Sox made official the signing of third baseman Adrian Beltre, and at the same time announced the trade of Casey Kotchman for Bill Hall. Hall can play every outfield and infield position, but has played more MLB games at the hot corner than anywhere else. These announcements virtually guarantee that incumbent 3B Mike Lowell will be traded as soon as possible. So Jerry Crasnick of ESPN claims he heard about the Mets and Red Sox discussing a swap of Luis Castillo and Mike Lowell. Because it doesn’t make much sense from any angle whatsoever. First of all, the Red Sox are set at second base with Dustin Pedroia. And they didn’t sign Marco Scutaro to a $12.5M deal to be a backup to Pedroia at shortstop. And Luis Castillo is not going to push David Ortiz out of the DH spot, no matter how bad Ortiz hits. The only thing that might make sense is the Red Sox quickly flipping Castillo to a third team for someone who better fits into their plan. A possibility, for sure. As for the Mets going after Lowell … though I did mention Mike Lowell in a frightening hypothetical trade of David Wright to Boston, and do believe he could be worthwhile as a platoon partner / backup plan to Dan Murphy at 1B, I don’t see the Mets as being that creative and bold. The truth is, Lowell might be able to handle SECOND BASE adequately, and provide enough punch to counteract defensive deficiencies — but again, the Mets are neither that bold nor that creative. Could it be a four-team deal with players and bad contracts flying all over the place? Anything is possible. But in this case, I’m guessing it’s pure bunk. David Wright to Red Sox? With the Red Sox still looking for a third baseman to replace Mike Lowell, and the Mets in need of pitching (where the Bosox have depth), is there a possibility that Wright could be moved to Boston? 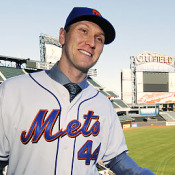 Jason Bay: No News is Good News? A blizzard has come and gone, and still Jason keeps the Mets at Bay (bad, I know, but couldn’t resist). But for Jason Bay, time is running out — quickly. He managed to alienate the team he should be signing with, the Red Sox, and they have moved on by signing Mike Cameron. Four more years in Fenway Park would’ve been ideal for padding his stats for a rare second free agency jackpot at age 35 — because he IS going to be worth $16M+ when he’s 35, isn’t he? Marco Scutaro Off the Table? According to Venezuelan news source Lider, the Red Sox have signed Marco Scutaro. Terms are unknown at this time, and the deal is yet to be official. So scratch him off the list of available second basemen / utility infielders, and stop voting for him when you Rate the Mets Free Agent Targets. The latest on Matt Holliday is that the Yankees aren’t interested (per Buster Olney), the Angels aren’t either, and the Red Sox and Jason Bay appear to be on the same wavelength. That said, the Mets may have only the Cardinals to bid against when the Holliday auction begins — right? Can Craig Hansen Get the Monkey Off His Back? 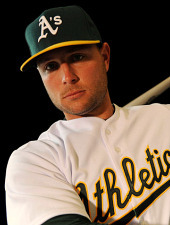 Craig Hansen was chosen with the 26th overall pick of the June 2005 draft by Boston Red Sox, and made his MLB debut less than three months later, smack in the middle of a heated pennant race. Hansen was not the best prospect in the draft, but was considered by many to be among the most polished — so it was not a surprise that he was in the Fenway Park bullpen so quickly. The 6’6″ St. John’s closer touched 98 MPH on the radar gun, had the best slider coming out of the draft, and was judged as having the appropriate temperament for short relief work. He zipped through 12 innings split between the Gulf Coast League and AA before laying an egg in Boston. 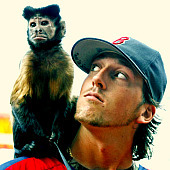 Though he was a disappointment in his first four games as a big leaguer, most predicted future success as an MLB closer.